The people at Upper Canada Mall were nice enough to contact me about their recent collaboration with JOYA, a New-York based creative-collective that specializes in fragrance, to create their mall's signature scent. 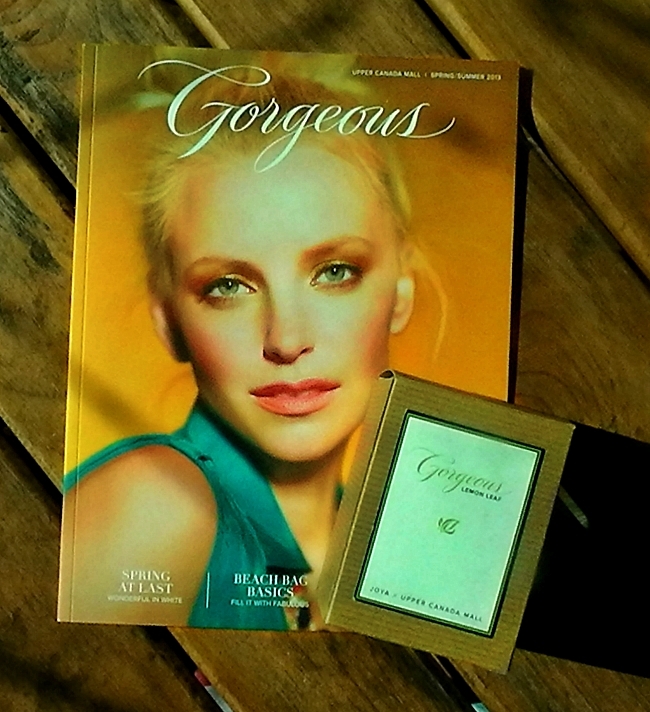 The mall gifted me their most recent issue of the their magazine, Gorgeous, as well as their finished fragrance piece; a beautiful handmade candle! The candle's scent is meant to encompass the energy of a confident and always-motivated woman, and the lemon leaf aroma that was ultimately chosen represents that perfectly. The scent was inspired by the stoneroot plant which grows around the York Region area, where Upper Canada Mall is situated. The fragrance is light and fresh with a very clean yet invigorating effect on the mind. Unlike other candles, it is a convenient size; I find that three wick candles are too large, and one-wick candles like this one are often too small. This candle is a comfortable medium size, and has an impressive estimated 60 hours of burning time! I got to experience this candles' scent for the first time when I ran a bath in the evening last night; it was wonderful! I find that sweet scents in the bathroom are often too overpowering and sometimes sickening. This fragrance really suited the bathroom nicely. I would recommend putting this candle in tiled spaces to keep things fresh and light without making the room over-scented. 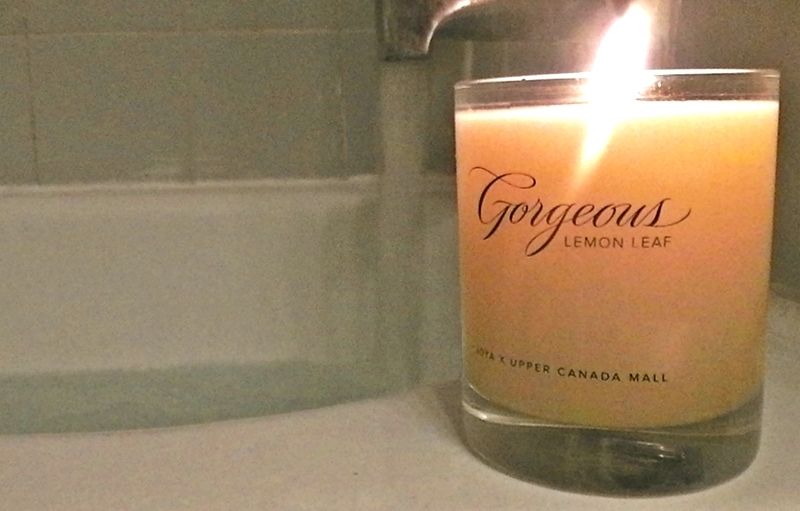 Also, the Gorgeous magazine Upper Canada Mall sent me was shamelessly read in the bathtub (what can I say!). I found a section that featured the candle (pages 44-47) and was really impressed. It described how the scent was chosen, how it was made, and it also contained an interview with JOYA's founder and president, Fredrick Bouchardy. I encourage anyone who lives in the York Region area to pick up this Gorgeous edition at Upper Canada Mall and check it out! 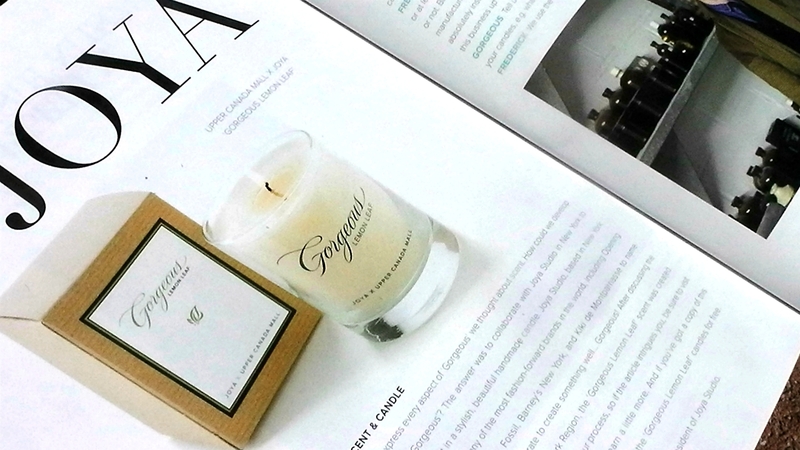 After you pick up a copy, you can get a free candle for yourself! Inside your issue, there will be a slip of paper that will allow you to fill out your address in order to receive 1 of 400 available free candles in the lemon leaf scent. Talk about an amazing deal! Thank-you again to Upper Canada Mall for allowing me to receive these awesome items, and I hope that this has allowed you to get your own free candle! Thanks for reading and I hope everyone has a wonderful day!